If you’ve been to an Edison Garden Festival, you know to expect plant sellers like Rege Malone, Tropiflora, and Peacock Cottage, all who have been coming to the event since it first started more than 10 years ago. Through the years, we’ve added food vendors and live music to the event and with more than 45 vendors selling plants and garden-related items, the Edison Garden Festival is now the biggest plant sale in Southwest Florida. This weekend, we have a few new vendors you will want to visit. 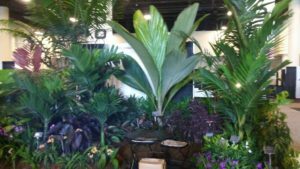 Searle Brothers Nursery will be bringing rare palms and 80+ varieties of crotons. We’ll host two new orchid growers: Sundance Orchids and Gross Orchids. Nature’s Art and Exploration is coming with staghorn ferns and Bonita Bromeliads will bring their specialty. And there’s plenty of food this year! If you love BBQ, you’re in luck: Jonesez BBQ is here all weekend and Tag’s Whiskey Bent Barbeque is serving on Sunday. Flavour Street is also bringing their food truck, Narrative Coffee Roasters will be onsite brewing fresh coffee and Love Muffins will be selling pastries, and muffins, of course. Also new this year: a plant pick-up area! 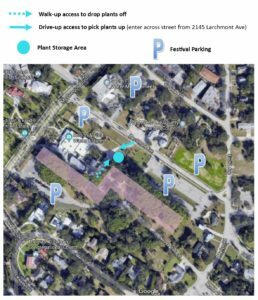 As you shop, you can drop off your plants in our designated plant storage area (see map). When you’re ready to leave for the day, drive your car to the designated entrance off Larchmont Ave and we’ll help you load your plants. 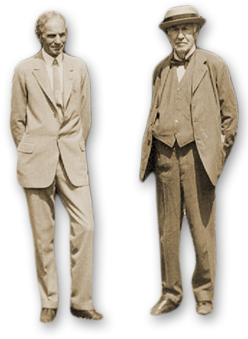 We recommend bringing your own wagon or cart to help you get your purchases to the pick-up area. 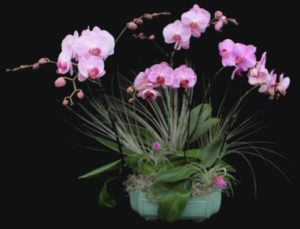 Live orchid arrangement from Sundance Orchids. Sample of Searle Brothers Nursery plants. Festival hours are 9 am – 5 pm on Nov 17 and 9 am to 4 pm on Nov 18. Free admission to the festival and free parking. See you there!